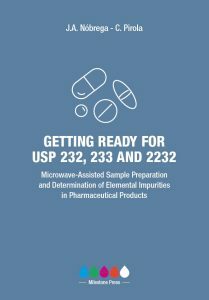 A new book titled “GETTING READY FOR USP 232, 233 AND 2232 – Microwave-Assisted Sample Preparation and Determination of Elemental Impurities in Pharmaceutical Products” is available. It adopts a Q&A style for easy reading and answers questions many analysts are asking about the overall implementation of the sample preparation and subsequent analysis described in the new chapters. The book includes an overview of the new guidelines, laboratory considerations, reagent choice, microwave technologies available, how to evaluate the efficiency of a digestion process, and general procedures for establishing an analytical procedure. The book also covers in-depth review of ICP-OES and ICP-MS techniques, and how to validate developed analytical procedures.